I-5 Sign. Courtesy Wikimedia Commons. A hit-and-run crash killed a 62-year-old woman on a North County freeway off-ramp Tuesday, authorities reported. 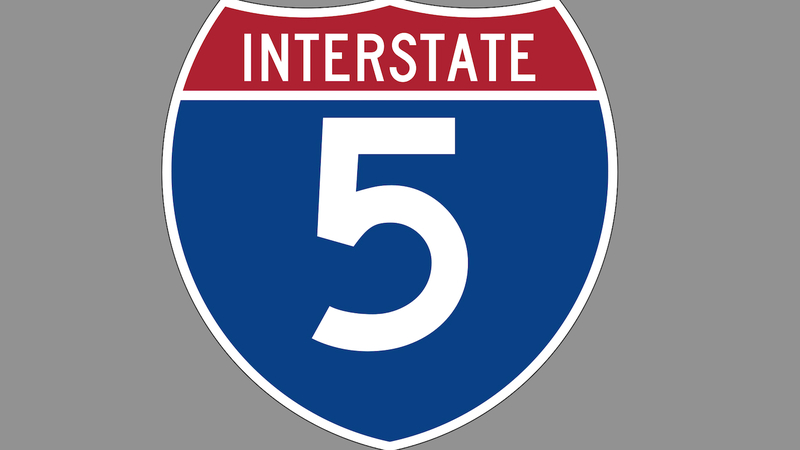 The victim, believed to be a transient, was found dead on the right- hand shoulder of the connector road from northbound Interstate 5 to Encinitas Boulevard about 6:30 a.m., according to the California Highway Patrol. Her name was withheld pending family notification. Based on broken-off auto parts found at the site of the crash, investigators believe the victim may have been struck by a 1995- to 2002-model Ford pickup truck or SUV, possibly an F-150 or Expedition, CHP public-affairs Officer Mark Latulippe said. There are no known witnesses to the fatality, and exactly when it occurred was unclear, the spokesman said. Anyone who might be able to help identify the involved vehicle or motorist is asked to call the CHP at (858) 637-3800.